Nairobi — Malaria is in the bull's eye of a global campaign. The target is zero malaria deaths by 2015. The challenge is how to get there -- and stay there. Nearly 2,000 children die every day from malaria, according to the World Health Organisation (WHO). For much of the past decade, malaria has killed as many as a million people annually. More than 90 percent of those deaths are in Africa. Non-fatal cases take a further toll, compromising immunity to other diseases and lowering productivity, as well as family incomes and national GDPs. Yet malaria is both preventable and treatable. In sub-Saharan Africa, 11 countries have managed to cut their malaria cases by half since 2000, according to the WHO. "Increased prevention and control measures have led to a reduction in malaria mortality rates by more than 25 percent globally since 2000 and by 33 percent in the WHO African Region", the organization says. A combination of methods is being used: insecticide-treated bed nets; indoor spraying to kill mosquitoes; access to rapid diagnostic tests; appropriate and early treatment; and effective referral and transport for those in need. Underpinning the progress has been the availability of resources. The goals of the international partnership against malaria "are translating directly into lives saved in historic proportions," said Ray Chambers, the United Nations secretary-general's malaria envoy and a co-founder of Malaria No More, in a World Malaria Day joint statement with the Geneva-based Roll Back Malaria coalition. Chambers said the U.S. $6 billion invested in the global campaign against malaria in the past six years has yielded "immense" returns. On Monday, Chambers, along with Princess Astrid of Belgium, a Roll Back Malaria special representative, called for an additional $3.2 billion "to get us to the point of having a chance to be at near zero deaths by 2015." 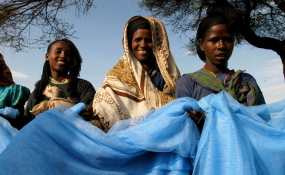 More than 300 million long-lasting insecticide-treated mosquito nets have been distributed -- enough to protect more than three-quarters of people at risk -- up from just five per cent in 2000. Indoor spraying of walls protected some 75 million people, compared to 15 million in 2005. Thirty-three million diagnostic tests were distributed in 2009 -- contrasted with only 200,000 four years earlier. Morocco and Tunisia were certified malaria-free by the WHO in 2010, joining Mauritius, Reunion, Seychelles and Lesotho. The "Oslo Accord", stemming from a meeting of malaria experts, policymakers and health organisations in Norway a year ago, recognized the progress made and endorsed an on-going approach to the goal of "Getting to Zero" -- no malaria deaths by 2015. Core strategies are integrating prevention and treatment with other disease-control programmes; strengthening local initiatives and national health systems; and engaging communities in malaria prevention and control. But a faltering world economy has become an additional challenge in the campaign to roll back malaria. Funding constraints threaten to stall the powerful momentum built over the past decade. And many countries that have reduced their malaria burden remain at high risk of losing those gains. According to an October report, "Maintaining the Gains in Global Malaria Control", malaria programmes face an "out of sight, out of mind" paradox. The more successful they are at reducing malaria cases, the greater the risk of reduced funding. The nature of malaria, the report warns, means that "even after suppressing malaria, countries must sustain their control activities year after year or else malaria will rapidly resurge". A review of research on periods of malaria resurgence since the 1930s found that the main causes were "weakened malaria control programmes, increased intensity of malaria transmission (such as movement of people or mosquitoes, weather or changes in land use), or technical obstacles including resistance of the malaria parasite to drugs". The article's lead author, Justin Cohen, from the Clinton Health Access Initiative (CHAI), said "malaria control programmes have been shown to be extremely successful in reducing the number of cases of malaria to very low levels, but history demonstrates that gains can be lost rapidly if financial and political support is not sustained". The researchers who undertook the review -- a consortium including CHAI, the Johns Hopkins Malaria Research Institute, the Center for Disease Dynamics, Economics and Policy, and the Global Health Group at the University of California (San Francisco) -- said that of the 75 instances where malaria regained ground since the 1930s, nine out of 10 were due "at least in part" to the "weakening of malaria control programmes". The recent emergence on the Burma-Thailand border of a strain of malaria that is resistant to artemisinin, a core component of the primary three-drug treatment for the disease, has caused great concern. Researchers have also discovered drug-resistant malaria strains in western Cambodia, signalling a need for greater vigilance and improved malaria controls in South-East Asia. According to an article published in the medical journal The Lancet on 5 April, efforts to control malaria are "vitally dependent on artemisinin combination treatments". If these drugs fail, warn the authors, Anne-Catrin Uhlemann and David A. Fidock, there are no other medicines "ready for deployment". The authors conclude with a call for careful monitoring of emerging resistance to artemisinin treatments. They also argue that the prospect of future widespread resistance to current treatment therapies points to the need to "implement all available measures towards malaria elimination that we can". Malaria has been a wily foe in most of the world for centuries -- surviving every strategy for eradicating it. But medical professionals and anti-malaria activists say the goal of stamping it out is finally feasible -- although debates within the community about how achievable and on what timeline are intense. At a Malaria Forum convened last November at the Bill and Melinda Gates Foundation in Seattle, Oregon, an international gathering of researchers and practitioners cited progress towards a vaccine, as well as the successes of multi-faceted, integrated approaches as reasons for optimism. Dr. Carlos C. (Kent) Campbell, director of the malaria control programme at the global health organization Path and a former head of the malaria branch at the U.S. Centers for Disease Control and Prevention, says, "It is now well documented that malaria programme scale up -- largely insecticide-impregnated nets -- has resulted in over 800,000 lives saved in the past decade, and the majority of those in the past few years." We know, he says, that "malaria is a leading killer of African children and the investments in malaria programme scale-up is a great return on investment." This is not the time, he adds, to allow funds and programs to be scaled back. "Malaria programmes require continual investment and continual application and continual levels of coverage, in particular of bed nets, to maintain the gains that have been achieved."